The West Australian Police shall lay more charges on the 100+ people involved in an all-in brawl on Friday night which turned Perth’s usually tranquil Kings Park into a place of terror. West Australian Police Commissioner Chris Dawson said he was “certain” that more charges would come from the late-night fight, that kicked off when two party busloads full of people were dropped in the Perth park. The brutal brawl, which left one man in hospital with a broken jaw, nose and severe head injuries, required 16 police cars to respond when it kicked off just after 10.30pm on Friday night. Commissioner Dawson said the two groups had “coincidentally” met out the front of Fraser’s Restaurant in the picturesque park but the meeting quickly turned “violent”. “There was a lot of aggression using sticks, weapons and other things. Several people were knocked unconscious. The mob consisted of two groups which were enemies for long. A woman who was giving first aid to one of the injured men had her handbag stolen in the chaos. Three people were arrested by police on the night and many more were told to move on. Police are now appealing to the public for any footage or pictures they might have taken of the brawl and want witnesses to come forward. 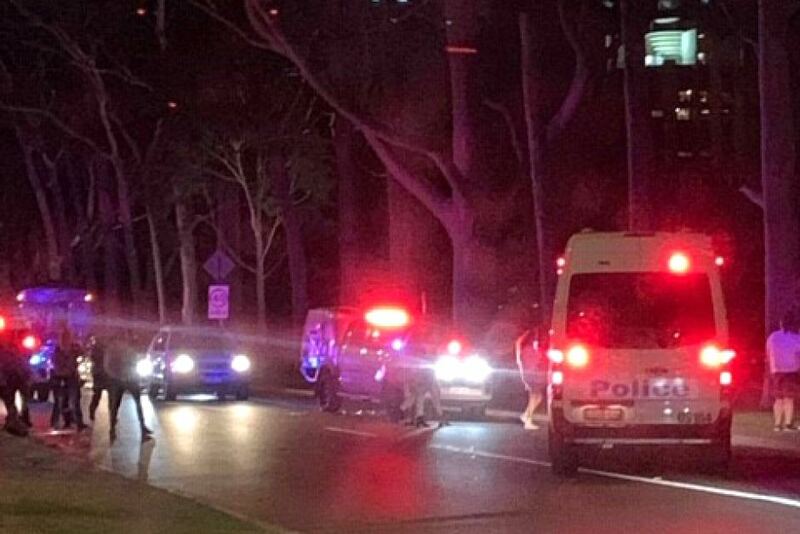 Kings Park was briefly locked down by more than a dozen police cars as officers from Perth, the canine unit and the regional operations group — a quick response team trained for public order issues — worked to control the situation. Tourists and families who spent their night in the park sought refuge inside Fraser’s Restaurant and even behind bushes as the partygoers fought outside. According to a witness, there was a lot of violence, vandalism, and drunken behavior. Another witness recounts that barstools were thrown. The police face a huge challenge in this case. The huge number of persons involved in this crime scene leads to contamination of forensic evidence collection process, in other words, it is extremely difficult for the investigators to recover evidence, which is usable in the court of law, because of chaos during that time, etc. Yet there is a lot of crime-specific information which can be gathered from the suspects. If a person was a part of the crime scene, then there is quite a lot of information which his or her brain grasped. This information will be embedded in their brain and cannot inscribe on a book/diary or any electronic medium. The other challenge, in this case, is that there are around 100 suspects. Gathering such evidence and pursuing the suspects is a time consuming, cost and labor-intensive task. The investigative agencies have been relying on digital evidence such as CCTV footage or pictures of the brawl. They have requested witnesses to come forward. At this moment they have little to none ways to determine if this was an intentional or an unintentional act. In such a case, conventional investigative methods can only do so much. It is difficult to pinpoint the perpetrators in such crimes of this nature such as riots and skirmishes. What is needed is a scientific and reliable ‘litmus test’. It is quick, objective and trustworthy. Similarly, the investigative agencies can use such technology to determine if a suspect possesses incriminating information about the crime under investigation. Brainwave Science, a US based company has developed and provides a unique and intelligent security solution which is able to help distinguish between suspect/suspects and innocents. iCognative is a test which can determine if certain information is known to the person being tested or not. It does so with amazing accuracy and statistical confidence. The information may be related to a certain crime, in order to detect if the person could be the perpetrator, or a witness or even unrelated. If a person has gang affiliation or criminal training, then their brain will have related information and it will respond positively when they are shown related words of images. They will be familiar with certain images. iCognative test uses a specialized headset which is worn by the person under test. Pictures, images, words or phrases related to a specific crime or related to the ideology being screened are shown to the test subject in succession. All this while, the headset looks for tiny positive voltages which the brain emits when it sees a stimulus it is familiar with. In this case, the stimuli which can be used to conduct iCognative test on all possible suspects may include details of way the fight is believed to have started, the locations of the fight, the time and date of the clash, suspected gang/clique which the clashing parties may have belonged to, CCTV footage the area of the clash, details of similar incidences in order to determine if the suspect has committed any of them. iCognative system analyzes these inputs from the headset and declares the result at the end of a usually 45-minute test. The result can only be ‘information present’ or ‘information absent’. It signifies that the test subject’s brain does or does not contain the information being shown and then the authorities can proceed accordingly. iCognative technology is highly applicable in almost 90% of all civil and criminal cases. Contrast this with the DNA and fingerprints, which are applicable in only 1-2% of all cases. Finally, there is no reason for the authorities to not use iCognative, the only technology which can help identify the guilty and avoid wrongful incarceration of the innocent.